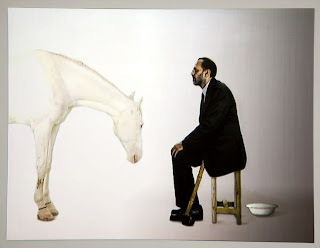 The most impressive exhibition in town right now, and perhaps the best show of all 2010, is the work of a 57 year-old British citizen of Punjabi origin. I’m referring not to Anish Kapoor’s Dilli Mumbai, but Ranbir Kaleka’s Sweet Unease at Gallery Volte in Colaba. Kaleka lived in Chandigarh and Delhi before leaving for England in 1985 on a Charles Wallace scholarship. Anish Kapoor, his junior by a few months, had by that time established himself in the London art scene. Kaleka stayed on in Britain for about a dozen years after gaining an M.A. in painting from the Royal College of Art. He returned to India at the end of the 1990s, and settled in Delhi. In the years since his return, he hasn’t had a single solo show in India. He’s famously non-prolific, known for taking months, even an entire year, to complete one of his hyperelaborate canvases. But he’s stepped up the pace in the past year, creating four works in 2010 alone, all of them video projections on painted canvas. Tushar Jiwarajka of Volte has taken a huge leap forward as a gallerist by mounting Sweet Unease. The image you posted is arresting. I look forward to reading more when you get back. I have to go and see this show again!